Where could we go with sail power in the Champlain-Hudson Waterway? With rising hopes and a good crew and plan coming together to launch our barge in 2013, I’m already thinking ahead to the next several years. I have to say that our current design has a lot of advantages for what we are planning as a group. It has low material costs, low requirements of time and skill for building, and is very cargo-friendly. It is small enough to transport overland on a simple running gear without a wide load permit, and to store easily for the winter. You might not want to take it out in the open ocean but then our plan would not call for that. And additionally, the design falls below the US. Coast Guard design-review threshold for cargo-hauling boats. Our goal is to build a sailing cargo vessel with a very low cost per ton capacity. I think it’s safe to say at this point that our 36′ Triloboat-derived design will have a materials cost of under $2000 per ton. Figuring in labor costs (which we needn’t do right away, this being a volunteer-driven build) we might be up to $6000 per ton. For a new-built sailing vessel this seems pretty good! In fact, if our little project grows, there might never be any reason to build a larger or more sophisticated design, if we can instead build multiple smaller boats. A fleet of sail powered micro-cargo haulers (and I think 8-9 tons qualifies as micro-cargo, at least by water-transport standards) could be buying and selling in many places at once. 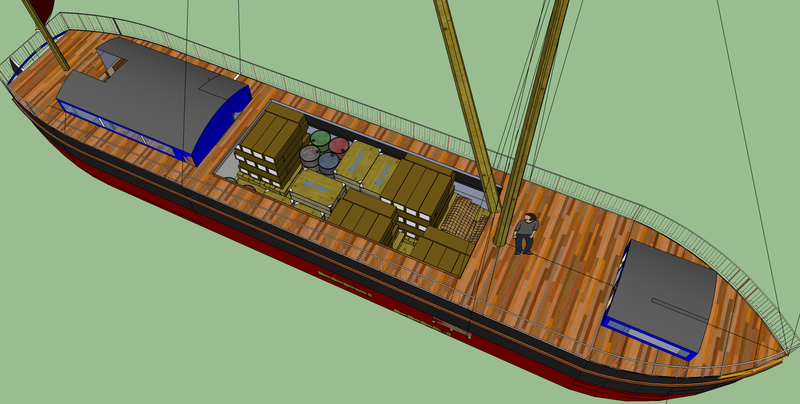 But could there also be an argument for a new-built boat with a larger cargo capacity, say for instance something along the lines of the Lake Champlain Maritime Museum’s canal schooner Lois McClure, or a typical Thames sailing barge? To speculate about this kind of thing is definitely getting ahead of ourselves, not having built one single boat yet nor navigated the route with cargo once. However I can’t help but ask myself, as the snow drifts blow around the windows, is such a thing possible? We’re pretty confident about building our 10.5 gross ton vessel on a budget. What about a 60 ton vessel? Could we do that too, or would be be better off to build six 10.5 ton boats instead? I can’t conclusively answer, not having the engineering credentials to design a 60 ton barge. But I would wager that we could probably build one for around $60,000 in materials, 64′ long and 12′ in beam, using 4′ x 12′ sheets of plywood laid athwartships for the deck and hull bottom. Just like a Thames Barge, but with the simplified Triloboat-style lines and construction. In a conversation a while back Dave Zeiger (aka Mr. Triloboat) agreed that it was possible, though we wondered together whether it would be more worthwhile than the building of multiple smaller boats. But let’s just ask the question, if we were to consider such a thing, what would it look like? This gives you some idea of the possible accommodations for both people and cargo on a platform this size. Now we have bunks for five or six in the focsle, in 3 separate cabins. The hold has nearly 6′ of headroom below decks, and the aft cabin has a more spacious galley and plenty of room for food, supplies, and gear in adjacent storage aft. 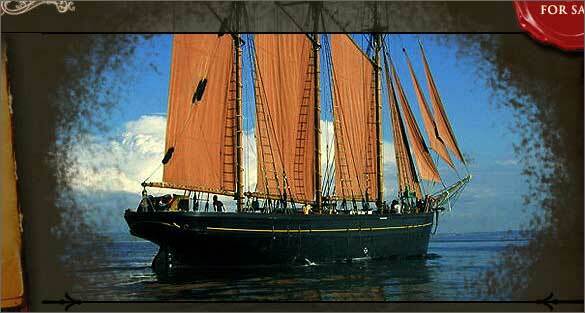 The more I learn about the “real” Thames Barges the more I think I need to go to England and sail on one for myself. Thames barges of about the same size and shape pictured here were the definitive semi-trailer of the pre-WWII English coast and inland waterways, not to mention the heroic service of these barges in rescuing Allied troops from Dunkirk! Yet despite their size they were routinely sailed by “an old man and a boy,” as you can here told in this neat little video, Barging Down The River. These barges are absolutely awe-inspiring to me, and the tradition of their use is kept alive by the Thames Sailing Barge Trust. I am sending in my membership for 2013! If it turns out that 10.5 gross tons is just too small to keep pace with demand for this service, we may consider larger barges with increasing seriousness as the project evolves. Here is a view of the aft cabin of our boat. Just outside the companionway you can see the spokes of the ship’s wheel on the right The table to the left can convert to an additional bunk, to supplement the sleeping space in the foc’sle. Full headroom! We should be able to sit five people around the table. If any readers are as eager as I am for this project to move from the realm of computer graphics to the realm of reality, I can say that there won’t be too much longer to wait. The VSFP team is mapping out an early-spring start to construction, to begin indoors in early March. I have a workshop on my farm, not big enough to accommodate the entire boat in a heated space, but big enough to build some large chunks of it. Namely, the bow and stern sections, which are a little complicated relative to the rest of the boat and have compound curves. This is the kind of work I like to approach in the comfort of my own shop with all the time in the world, rather than out under the March sky. We have an ambitious plan to launch the boat by July in order to have enough time for testing and training before we sail south with cargo in September 2013. Of course in addition to building the boat there is also a large amount of work developing the web platform for the project and building the network downriver. To that end am planning a visit to some potential partners in the Lower Hudson and NYC later this month. I am greatly encouraged by the reception the idea of this project gets down there, and I’m sure we can find a way to make things work. Robert LaValva, organizer of New York’s “New Amsterdam” farmers market said to me, “what New Yorkers will really be attracted to is maybe not so much this boat itself, but the idea that this could be the kind of thing we’ll be seeing a lot more of.” I still do believe that we will be seeing more of this kind of thing, all the more so because this effort is driven by small farmers, who are some of the most versatile, adaptable, and innovative people you’re likely to meet. It will work because it helps those farmers tell their stories and excel at what they do. It’s been our aim from the start to create a project with community-wide benefits, but with particular focus on farmers. I am amazed by the number and the inspired nature of colleagues we at VSFP did not know we had. Take a look at New Dawn Traders , a fellow startup based in England and aspiring to trade the old slave triangle route, wisely renaming it the “freedom triangle,” with an emphasis on environmental stewardship and fair trade. Also Consider Sailing Cargo Ship Company, another startup based in Nova Scotia and slated to start up next month. What a stunning vessel they are using. Imagine a new global trade network comprised of inland and inshore trading boats like the Vermont Sail Freight Project’s sailing barge, meeting and trading in a busy port with tall ships from across the sea. And here is what gives me the most hope that I’ll see such a thing in the near future: The way we trade and transport now is just way too costly, on so many levels. 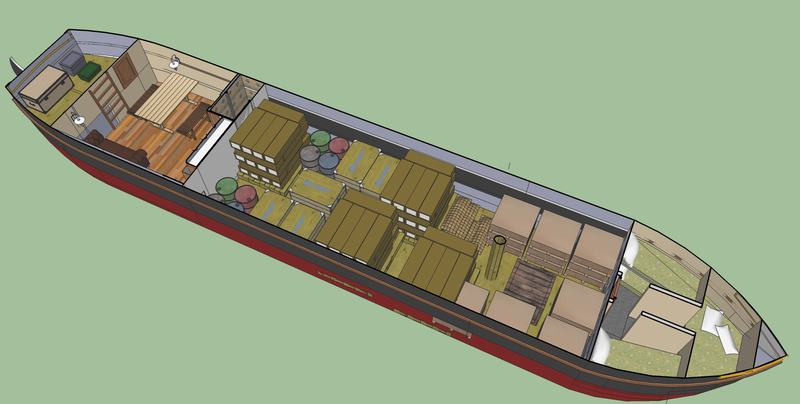 Here you can see a view of the inner structure of our planned barge. It is 8 feet in beam and 36 feet long, and features five bulkheads. This is probably a little excessive but will add to strength and help protect cargo in the event of a breach or leak. 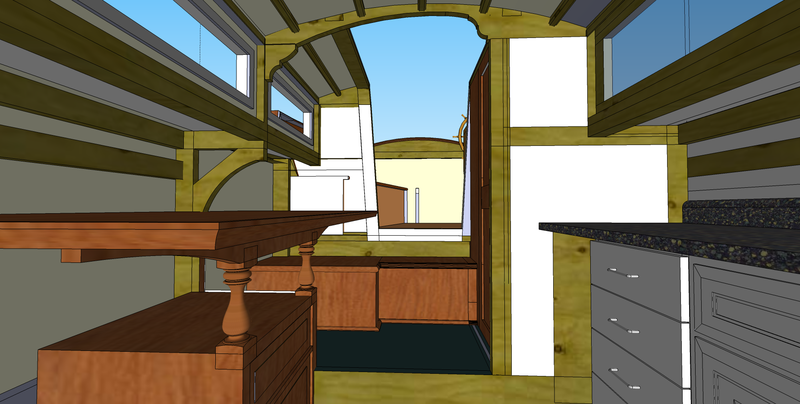 The sides and the belowdecks space are four feet in height, making maximum use of the width of 4′ x 8′ sheets of plywood. As an improvisation on Dave Zeiger’s Triloboat, we’ve elected to point the bow, with matched curves in both dimensions (which Dave calls an “advanced barge,” with turbulence-reducing properties) and bring the stern sides in some too as you can see. This design involves curving the bow and stern chine logs (reinforcing framing members where the bottom plywood and side plywood join) to curve in two dimensions but we’re up for this challenge. We plan on using “tape and glue” joints and sheathing the whole with fiberglass. The forward deckhouse provides light and headroom in the sleeping area. The aft deckhouse does the same for the galley and head, and this area can convert to sleep maybe two more people. There is 6’6″ headroom in the center of the cabins. Burlington to Brooklyn and Back Again. Here’s another rendition of our proposed route. On the New York side, things are less settled. We have some expressions of interest from some waterside partners in Mechanicsville (near Saratoga), Tarrytown, Ossining, and Manhattan. But we have a lot of work ahead of us to build the network the project needs. To be a little more specific, we expect to need a dock of some kind where the public can have access for a period of two to four daylight hours. It does not need to be a marina or commercial dock. Any dock that a shallow-draft motorboat can use we can also use. Our boat will be 36′ long x 8′ beam and 10.5 gross tons. We plan to visit each site and coordinate logistics with local partners. I personally am hoping to make arrangements to dock in each one of the Hudson River towns and cities on the map. If you live in one of these areas, and can help with this planning or know someone who can, please get in touch!